Why was Ahmed Shehzad dropped in the first place? 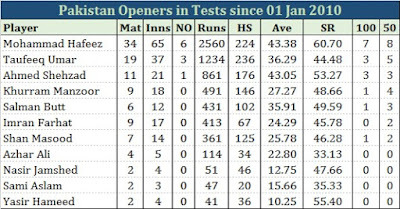 Imran Farhat, Shahzaib Hasan, Awais Zia, Imran Nazir ... Pakistan has had a number of mediocre openers in the past. The list is endless. But there have been none worse than Khurram Manzoor. Just like Sami has for the bowlers, Khurram has set the bar really really low for Pakistan's openers! If reports of Ahmed Shehzad being recalled for the World T20 to replace Khurram are true, then I could not have woken up to better news. Sure Shehzad has had a bad year in international cricket. He has been woefully out of form. However; he did well in the PSL. If Sharjeel Khan and Khalid Latif can be selected due to their PSL performances then there was no reason to drop Shehzad in the first place. Despite his recent bad form, Ahmed Shehzad has been Pakistan's most trusted opener, along with Mohammad Hafeez, across formats in past 6 years. There is absolutely no reason why Shehzad and Hafeez should not be opening for Pakistan across formats. If only Pakistan's selectors smoked a little less pot and paid more attention.